Imagine there was a new Unabomber at work in the US, sending letter bombs out across the nation. Now imagine there was one in every state, so that 164 letter bombs went off in one year, killing 36 people, 15 of whom were children. Would that make headlines? So commences a review by Paul Byrne of “Bomb Harvest” in the Sydney Morning Herald. An Australian documentary which follows the work of an Australian called Laith Stevens. Paul’s review is simply titled Bomb Harvest and can be read by following the link. There is a handy trailer which gives you an idea of what the movie is about. I went along to the Roseville Cinema tonight to have a look. Regrettably there were only three in the theatre. 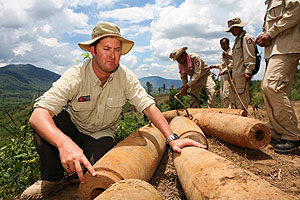 But we got a clear message about the danger of unexploded ordnance, and the way the filmmaker has you on the edge of your seat as cute little kids unearth bombs is worth the effort to catch this documentary if you can. It did not enrage me (there are some images that might be confronting) as Byrne warned it might, but the message that came though most clearly for me was the capacity we all have to make a difference, even if we are only one person. Laith Stevens is doing that with his life, and what he does has a direct and immediate benefit for some of the world’s poorest people. It is inspiring stuff. Sadly it makes too few headlines Paul.